1stQuad Solutions AG | The new "insider"-the modern CKW intranet for 1,700 employees. Designed, implemented and introduced in just 3 months. The new "insider"-the modern CKW intranet for 1,700 employees. Designed, implemented and introduced in just 3 months. The CKW has written a piece of Swiss electricity history. It has been supplying central Switzerland with electricity – from turbine to power. What started with a hydroelectric power plant in Rathausen is now a company with more than 1,700 employees. The new intranet "Insider" has been available to CKW employees since October. "Insider" runs on Office 365 and is based on the SharePoint add-on "Wizdom." In a close collaboration between CKW and 1stQuad, the new intranet was designed, implemented and introduced in just 3 months. The starting position at CKW was clear. The previous intranet should be replaced and a new modern communication and collaboration solution was created on the basis of Office 365 platform. But how do you realize a modern intranet based on Office 365? The CKW decided to evaluate various so-called SharePoint "add-ons" – which typical intranet basic requirements already cover well. The evaluation ended in a pocathon in which 3 service providers were commissioned, requirements already prioritized by CHP. To implement and present user stories with their respective solution on site. At the end of the two-day Pocathon, CKW opted for 1stQuad and the Intranet/Digital Workplace "add-on" product Wizdom. 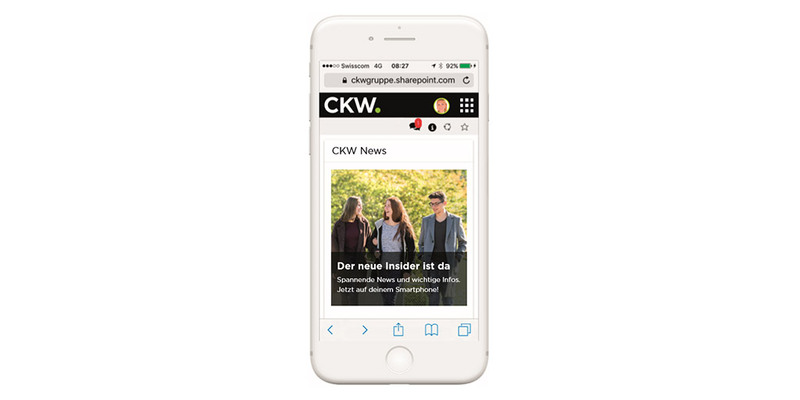 The new CKW Intranet "Insider" is responsive, so it is displayed on desktop, tablet and mobile phone in a user-friendly way, and is accessible to all employees from all over the world. News ' communication is repersonalised, i.e. Target-group specific in different channels. Often used information and tools are easily accessible to the home page. But "insiders" also enables digital collaboration in so-called "virtual workspaces," which are easily accessible via the main navigation. "Wizdom is easy to use-both for administrators and for the end user-and can be customized to meet customer needs. An ingenious product that meets the demands of a modern communication and collaboration solution! " "Our agile project approach (scrum) was well supported by 1stQuad. After a few sprints, a joint, cross-functional team established itself. 1stQuad impressed with a very broad skillset from technology to strategy topics, which were used at all levels such as management, leadership and employees in a ready-to-eat manner. The CKW Group also includes other companies whose appearances regarding them. Logo and colors but also content are different. For these, Wizdom was able to realize different areas with their own branding, so that the employees of these companies can also find themselves in "their" intranet. A new introduction of an intranet always requires appropriate communication and change management measures. So it was, for example, Until now, it is not possible for CKW employees to access the old intranet with a mobile device. This innovation had to be made known to the employees. 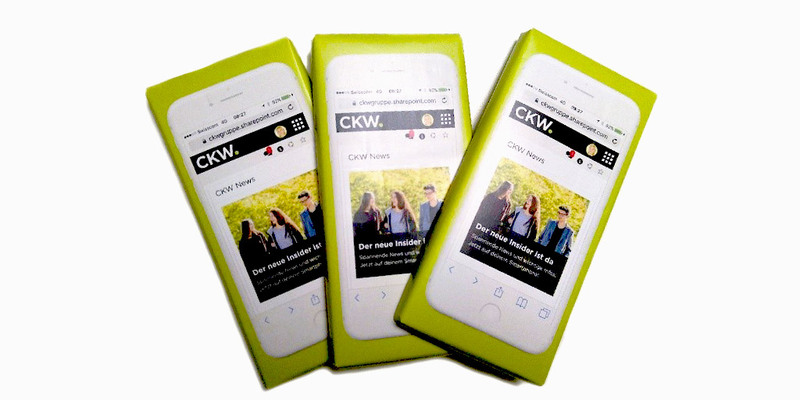 The creative CKW corporate communication therefore had the quick instructions for access to "insiders" printed by means of smartphones, on the packaging of a bar of chocolate and thus, so to speak, left the initial onboarding. 1stQuad started intensively with the different intranet/Digital Workplace products or SharePoint "add-ons." Wizdom, from the Danish manufacturer of the same name, was quickly convincing. Currently, 1stQuad is implementing Wizdom-based Intranets/Digital Workplaces at several companies. With Wizdom, a modern Intranet/Digital Workplace can be realized and introduced for a larger company in a short period of time. The typical intranet basic requirements contained in the Wizdom feature range, as well as the customization/expansion options, offer a lot of flexibility and allow for quick, agile implementation. Wizdom is also flexible in terms of architecture, and can be online with SharePoint on premises as well as SharePoint. Office 365. Do you also want to renew your intranet and better digitize your communication and collaboration processes? Want to learn more about the possibilities with Wizdom? Contact us. Our experts are happy to help.